-Make the cake: Beat the egg yolks with sugar, cocoa ,flour and water. And beat the egg whites gently. -Put it in three round pans of different sizes. -Put it in a medium oven about 3/4 heure. -Make whipped cream with fresh cream and sugar. -When the genoises is cool , cut into 2 two of the Genoese to the head and body, put whipped cream and cherries, replace the other disk and top it with nutella. -With the third genoese ,make tail ears and garnish it with nutella. 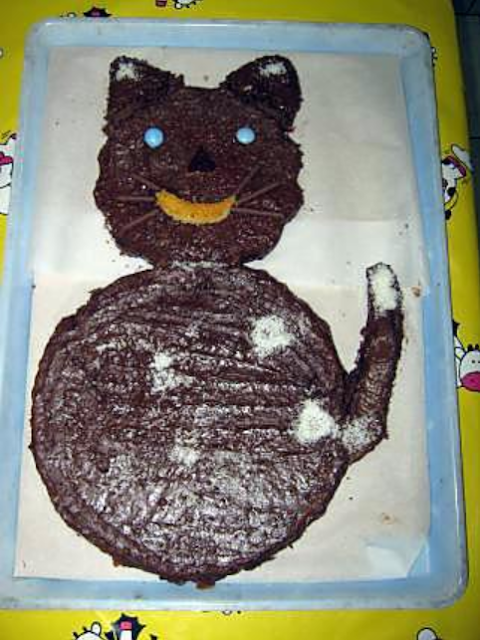 -And garnish with smarties for eyes, and mikados for whiskers and a piece of sponge cake without nutella for the mouth, a little grated coconut to make white spots. -That's a pretty darn good and beautiful cake for a birthday.